"Can a painting be a painting if it doesn't have drips?" There's a fundamental discordance in any discussion of Andy Warhol�his self-effacing public persona prized banality and lack of content above all else, and yet the claims on his behalf are that he is Picasso's only worthy competitor as the greatest artist of the 20th century. This studious documentary is a fair look at Warhol's emergence and the personal and cultural circumstances that led him to international celebrity, courtesy of soup cans and boxes of detergent and bottles of soft drinks. Ours has more than once been called The Age of Warhol, but even if you find that a little grand, Ric Burns' smart film is a fine introduction to the man and his times. Burns traces the familiar biographical basics�the child of central European immigrants, Andy (born Andrew Warhola) grew up in a Pittsburgh neighborhood that felt less like the Middle West and more like a Slavic ghetto. His was a religious family, and among the most interesting things here are the lingering shots in the church that the Warholas attended each week for hours at a time, for the iconic images of religious figures that festoon those walls clearly had an influence on Andy's later portraits of Elvis and Marilyn and Liz. The film follows him to New York, where he found early success as a commercial artist, but he couldn't get himself taken seriously in the world of high art�in a time dominated by Abstract Expressionism, his work was too figurative and too whimsical; and in those years when Jackson Pollock was everyone's idea of the tortured, manly artist, Warhol was fey, retiring, and delicate. He broke through, of course, along with Jasper Johns and Robert Rauschenberg, and Pop Art knocked Abstract Expressionism out of the box in 1962 or so. Burns and his collaborators have assembled an extraordinary amount of documentary material�piles of snapshots, ragged old moving footage, pictures of Warhol's works in their first installations, souvenir pictures from vacations he took. 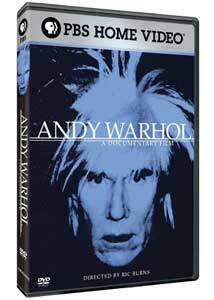 And the film interviews many who knew and worked with Warhol, a parade of artists, photographers, filmmakers, curators, writers and art historians�they're articulate in a way that Warhol deliberately was not, for one of the principal subjects of the film is what the narrative track aptly describes as Warhol's "studied insistence on his own shallowness." At four hours, it is rather extensive; Part I ends with the triumph of the Campbell's soup cans, and on some level, you sort of wish that you could leave things there. (It's a lot like finishing the first volume of Peter Guralnick's extraordinary biography of Elvis Presley, Last Train to Memphis, with Elvis young and handsome and on his way into the Army�you can freeze that moment, but you also know that the fat, bloated, drug-addled Elvis is an inevitability.) Part II focuses extensively on Warhol's Factory, and you see him burning through people�drag queens, meth addicts�in a chilling manner purely for the service of his art. Of course the film deals with the attempt to assassinate him; and happily we're spared too much of the last years, with Warhol as a Page Six staple and Studio 54 regular. The Burns formula is kind of put to the test by this project�Ric and Ken are very good in conveying lots of information, but their somber narration track (here read by Laurie Anderson), talking heads intercut with archival images, and actors reading from the writings of those being profiled (Jeff Koons handles the chores for Warhol's words) are techniques that don't seem to lend themselves readily to irony and humor, and you can't tell Warhol's story without healthy doses of both. But the film is a great starting point, and in many respects we do live in a world shaped by Warhol's aesthetics, something you'll see in the supermarket as readily as you will in the museum. Image Transfer Review: A pretty sturdy transfer; as you might expect, the archival footage varies in quality and much of Warhol's own filmmaking was deliberately technically imperfect, so picture quality can be variable. Audio Transfer Review: As with the image transfer, the older footage varies, though the well-shot new interviews and the readings on the audio track sound fine. An extended and worthy overview of the times of an artist who put his personal imprint on our visual life in a time of mass reproduction.